Due to our commitment to quality, we endeavour to develop a superior array of Solar Mounting Structure for our esteemed customers. The offered solar mounting structure is an assembly comprising of units and components required for laying a solar power grid. These products are used in different solar projects at various industrial sector. The entire range we offer is designed by trained professionals utilising optimum quality material and highly advance machines. The offered structure is easily available at very affordable prices. With due precision, the offered Solar Mounting Structures aremanufactured by our deft professionals with the use of supreme grade components and the advanced techniques. In order to meet varying needs of clients, these structures are made available in both standard and customized specifications. Used for mounting solar panels, these structures are made available in bulk at reasonable prices. Structures are an excellent solution to rural properties as they can be used on mountainous and rough terrain. The solar mounting structures designed by E-Pack are expertly designed and easy to install. 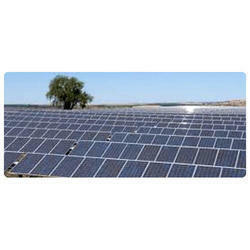 E-Pack solar Mounting structures are durable and long lasting. 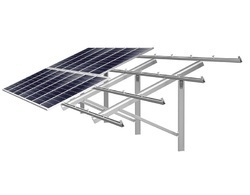 E-Pack solar Mounting structures are light in weight. These solar mounting structures are suitable to all weather and climatic conditions. We are manufacturers, suppliers & exporters of Module Mounting structures, Solar Mounting Structures & Solar Structures from India. E-Pack offers a wide range of solar mounting structures, module mounting structures with Rectangular hollow sections, square hollow sections, tubular sections, MS angle section, C-Purlins section, Z-Purlins section etc. E-pack having an expertise designing team to design these solar mounting structures whether ground mounting structures, roof mounting structures etc. There is no compromise on specification either: the flexibility, the load bearing capacity & quality. E-pack offers the complete turnkey solution for solar mounting structures & Module Mounting Structures under one roof starting from designing, production, fabrication, project management and installation. E-pack has successfully completed more than 75MW of solar projects all across the world. These solar mounting structures are light in weight and durable as they are designed to ensure optimal weight. These solar mounting structures are an excellent solution to rural properties as they can be used on a mountainous and rough terrain. These solar mounting structures are expertly designed considering wind load. Dead load, seismic zone etc. and suited to any geographical region. E-pack designs these solar mounting structures which have a minimum service life of 25 years.